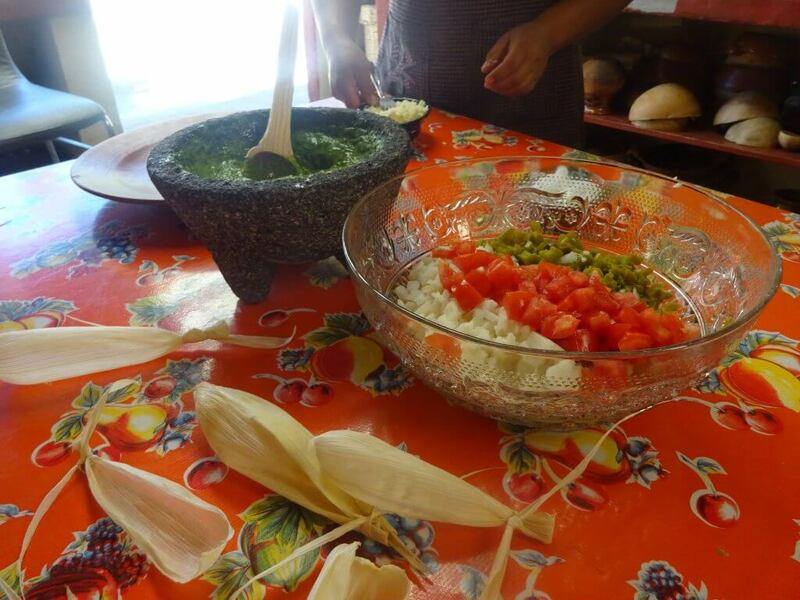 Attending a cooking class was high on my list of “things to do” in Mexico. I’d never taken part in a cooking class before, but I love to cook. When backpacking it can be hard to cook properly, you never know what the hostel kitchen is like until you get there and you can’t rely on a decent stock of free herbs and spices. A properly stocked kitchen is one thing I really miss when travelling. I’d also heard a lot about Mexican cuisine. 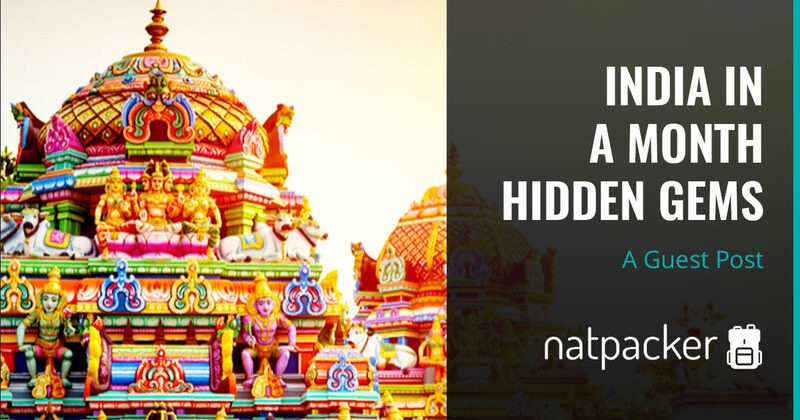 That it is different everywhere and not too like what we have at home. 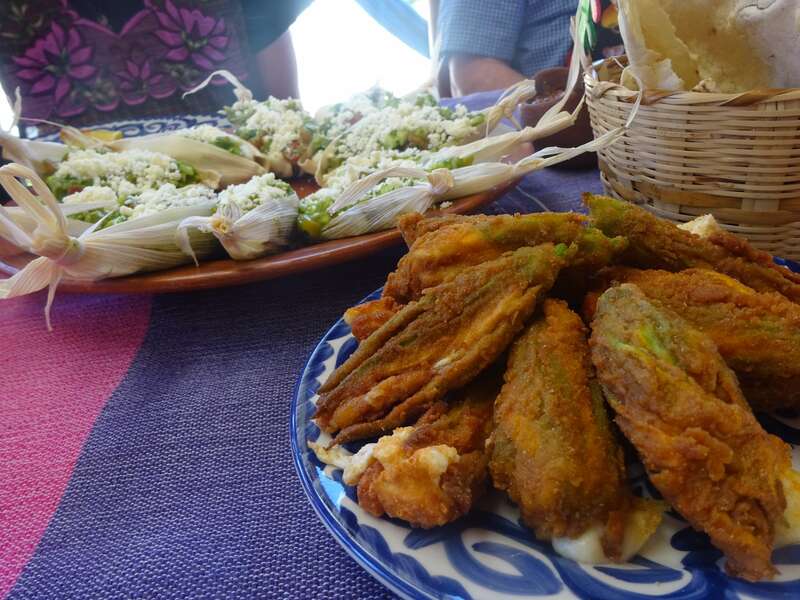 I was around the halfway point of my #Mexpacker adventure and had come to appreciate just how different the food is all over the country. 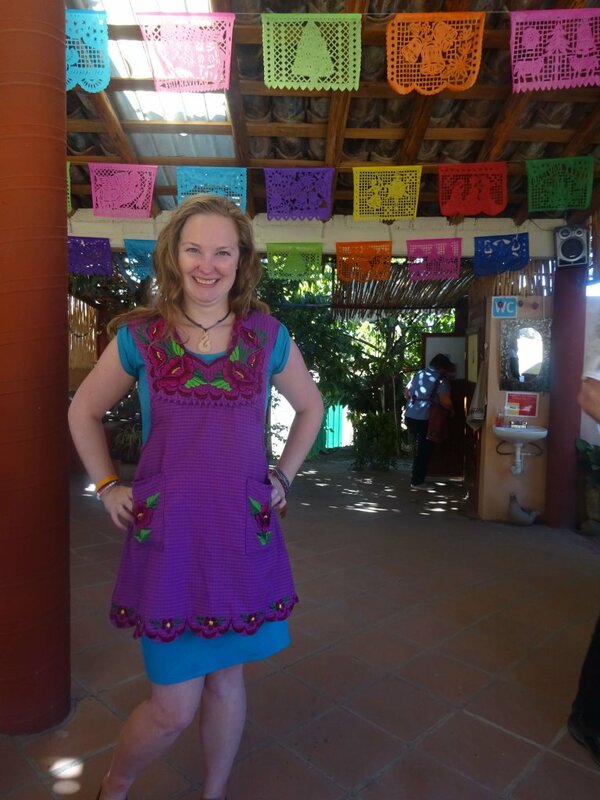 From the Yucatan to Chiapas and on to Oaxaca the food had changed from town to town, yet there were always tacos and tamales! 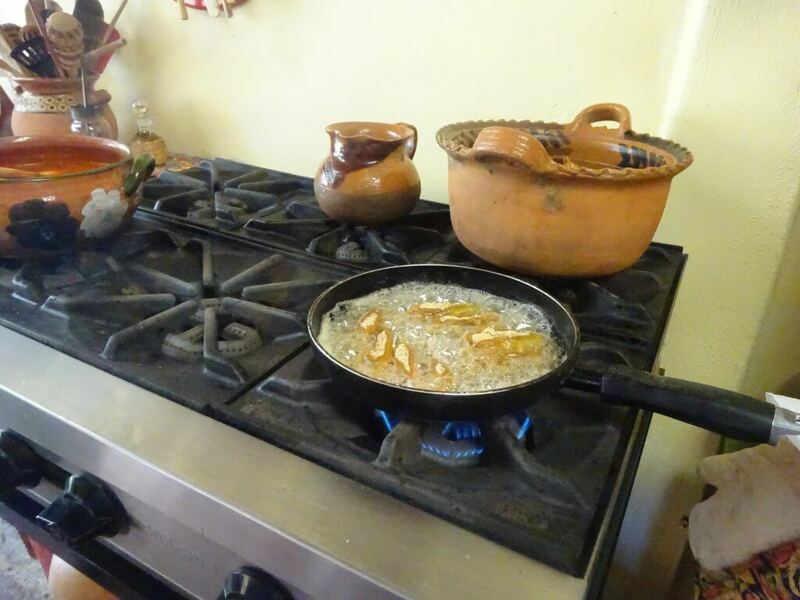 I didn’t manage to get to a cooking class on the Yucatan, which was a shame, so I was determined to go to one in Oaxaca. 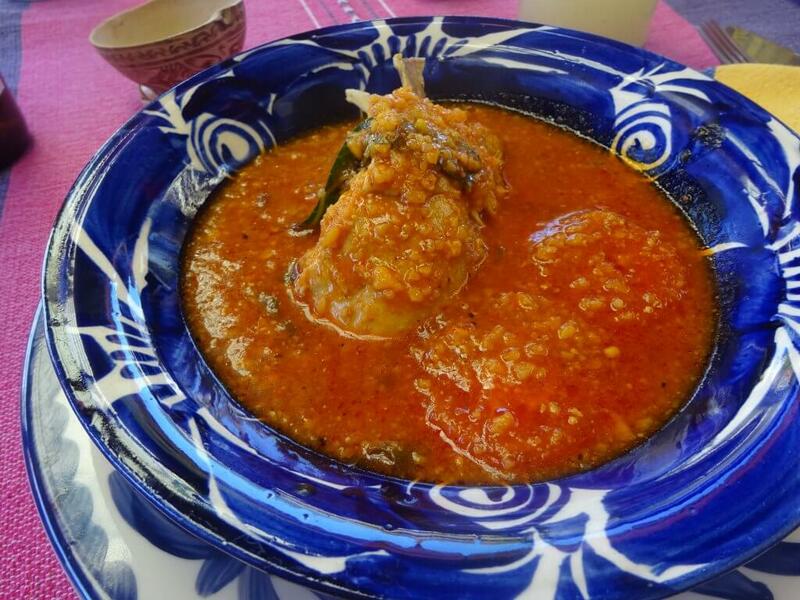 Both the Yucatan and Oaxaca are a foodies paradise. 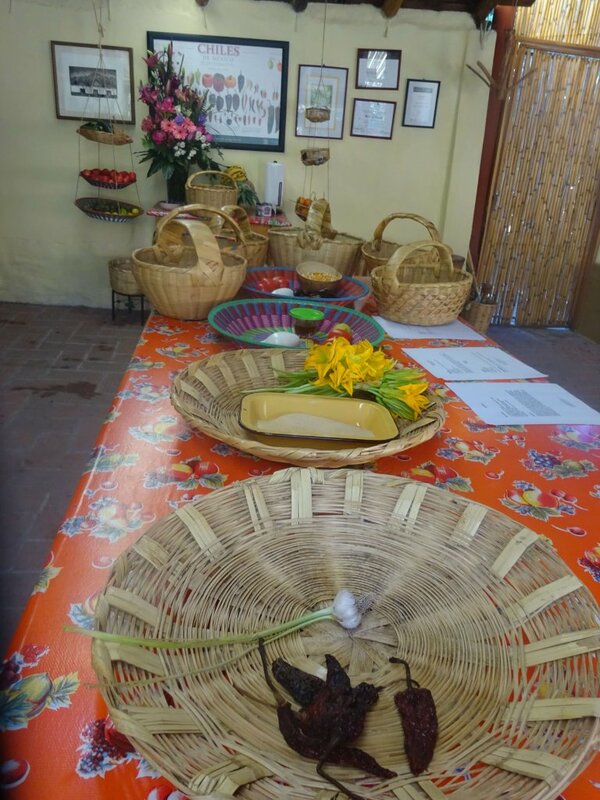 So I found El Sabor Zapoteca (which means the flavour of Zapotec – the Zapotecs are the natives here) and got booked on their cooking class. Disclaimer: El Sabor Zapoteca hosted me on their cooking class, in exchange for honest and unbiased coverage. This post is my own personal experience of the class and all opinions are my own. We had to meet for the cooking class at the Botanical Garden at 8:30. This meant, we would not really have time for breakfast. So me and Dave grabbed some fruit from the breakfast for the short walk. Luckily the owner wasn’t around or we’d have ended up chatting, well trying to! By 8:15 (typically English and early) we were stood outside the Botanical Gardens. There were two other people there and after a few minutes we asked if they were waiting for the cooking class, they were. A few minutes later two more showed up. Me and Dave were definitely the youngest by quite a few decades and the only ones not from the US! Not quite what I had expected to be honest. Two cars pulled up, a little after 8:30, and one of the drivers introduced himself. We split up into the cars and set off to meet our teacher, Reyna at her house. As we drove along it became very clear that I was the only one that had read the itinerary before joining the tour. 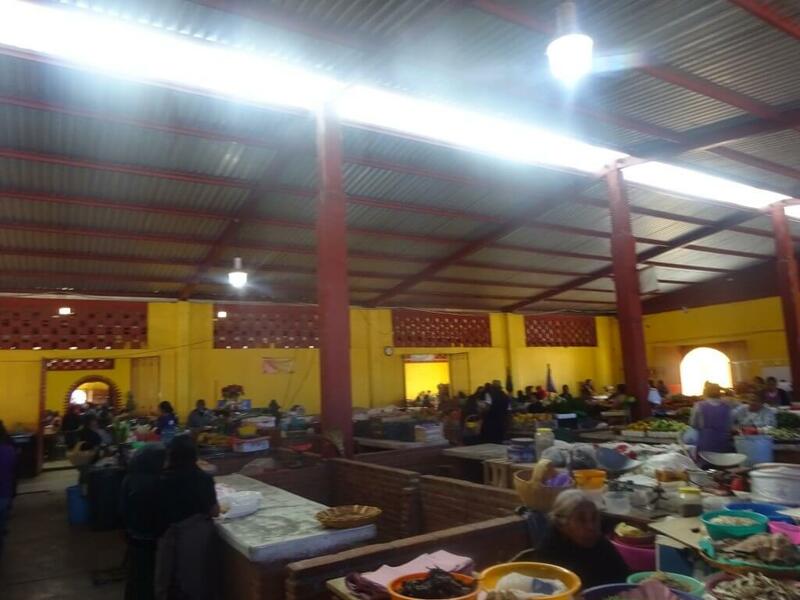 Other people were discussing which market in Oaxaca city we would be going and as we went completely different directions they became increasingly confused! 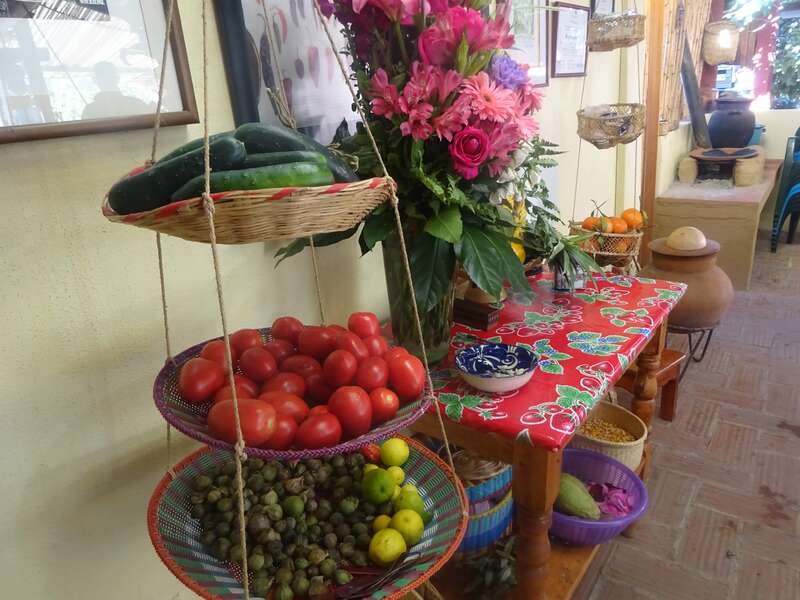 Whereas I knew we went to Reyna’s house in Teotitlan and then to her local market. Teotitlan is about half an hour from Oaxaca, it’s full name is Teotitlan del Valle and is a Zapotec town. We pulled up to a house, I say house, more like a small estate. It was massive! Just the front gates were impressive. Reyna came out to meet us and welcome us to her home. We were led into a huge open-air kitchen. On the large table were plates with various ingredients in them. These were the ‘Store Cupboard’ items. They were already divided into four plates, and what would be used for the different recipes. Reyna gave us each a document with recipes on. This would be what we would cook today. She also explained each one, the ingredients already there and what we would add form the market. This recipe is a type of mole, and one that is often served at weddings, as you can only make a large batch. The chicken was already cooking in a large pot of water, bubbling away merrily. Basically a cactus salad with avocado dressing. 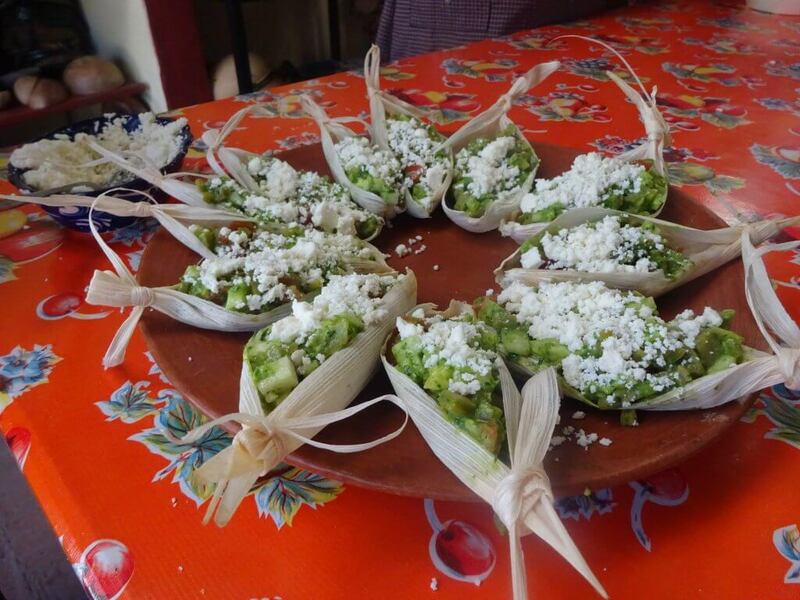 But we were missing quite a lot from this recipe, such as cactus, Oaxaca cheese and coriander. The pumpkin flowers were already there waiting to be stuffed, though they needed preparation. Though we would have to get practically all the ingredients for the salsa from the market. After all the explanations and having a look over the recipes it was time to head over to the market. Reyna gave us each a woven shopping basket (no plastic bags allowed) and we set off to the nearby market. It wasn’t far to the market. Along the way Reyna told us not to take pictures of people, due to the local beliefs. 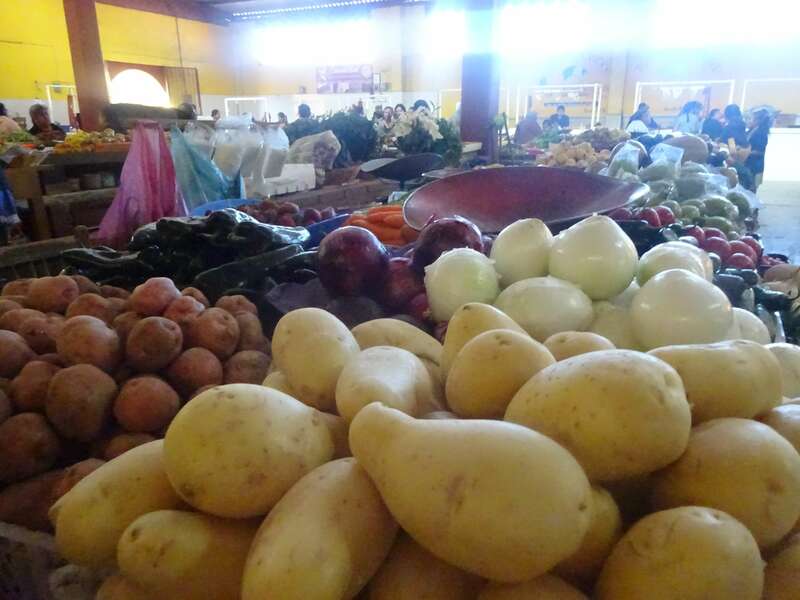 General pictures of the market and the produce were fine, but don’t focus on the people. The market was much bigger than I’d expected! With different sections for fruit and veg, cheese and even aprons. 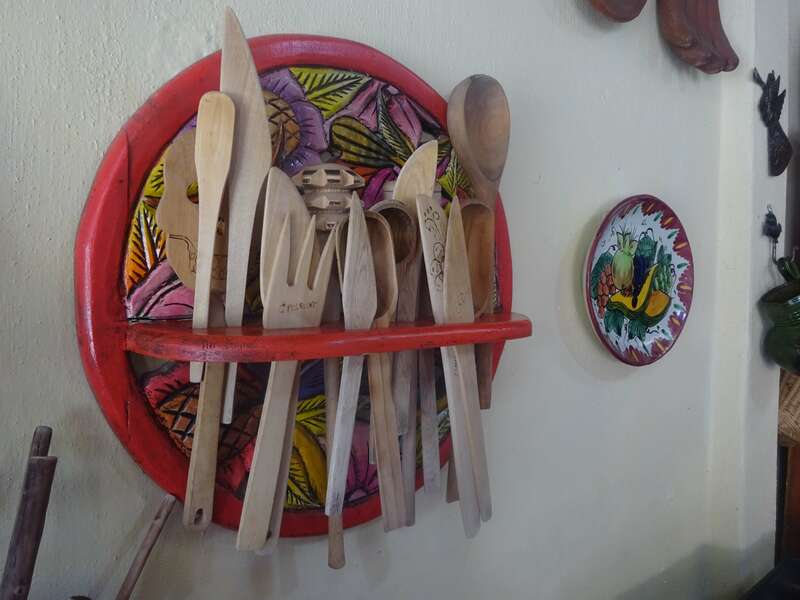 As we walked around Reyna pointed out different foods and explained about them, whether they were local cheeses or dried chilis, there was always something to say. 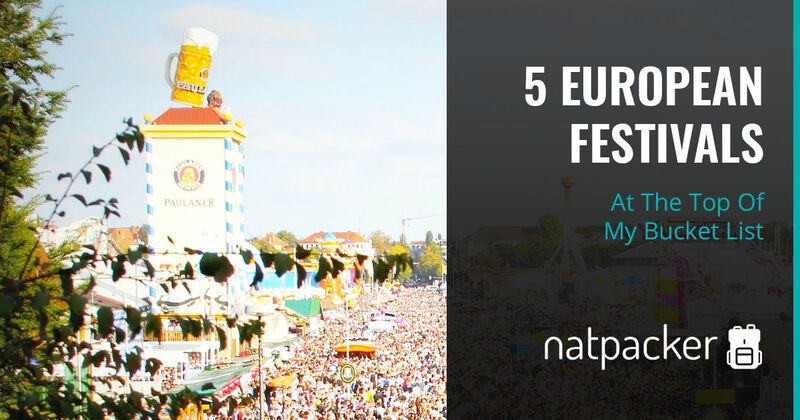 As we wandered around I realised that Reyna spread her spending throughout several stalls. Buying one or two items from each. Each product went in a different basket, so that we all had something to carry. 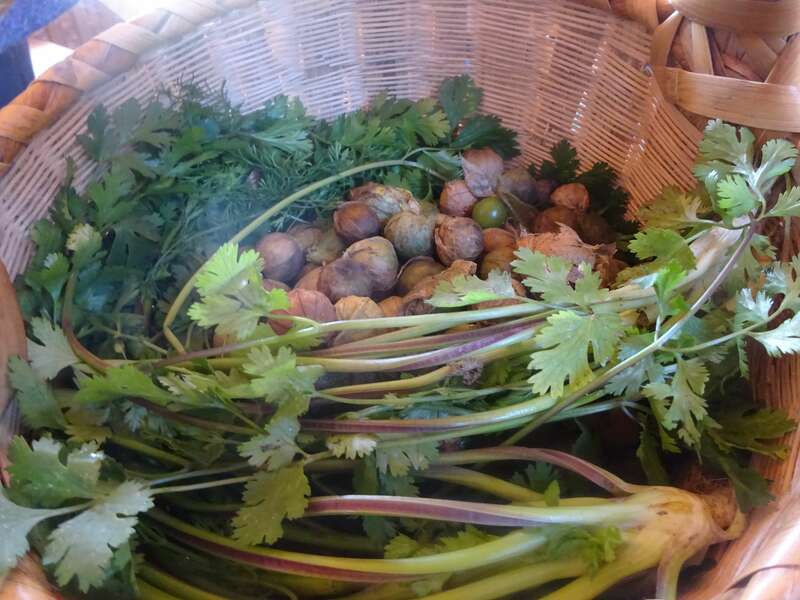 We bought tamales, Oaxacan cheese, fresh herbs, tomatillos and more. I have no idea how long we spent shopping, but it went quick! After walking back to the house, Reyna put our new ingredients with the ‘store cupboard’ ingredients. 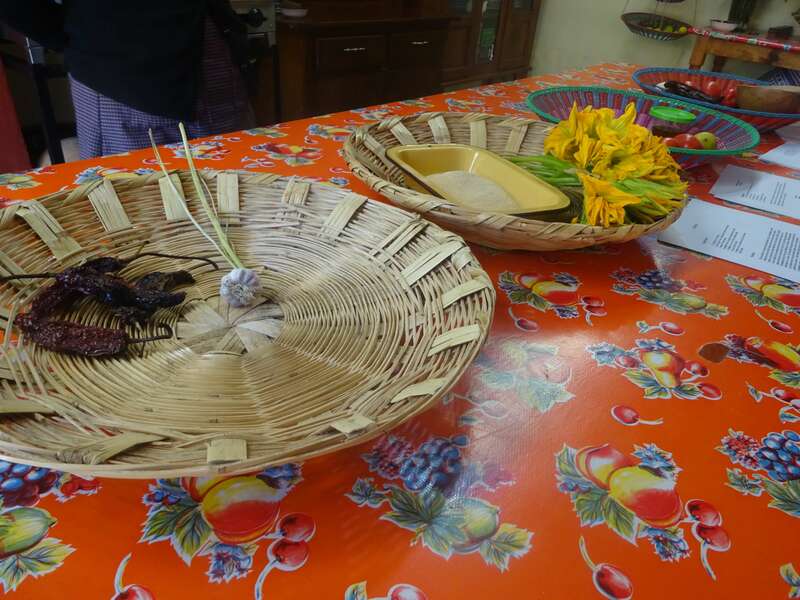 They were all divided into the recipes they would be needed for, but the baskets were now complete! Before we would get cooking Reyna invited us all to sit down at the table. As we sat Reyna’s helper was making hot chocolate. 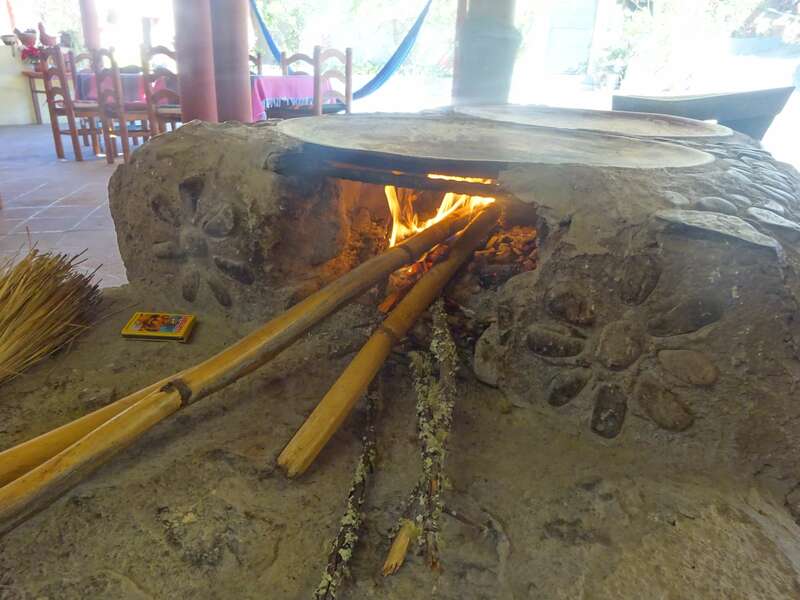 In Mexico a stick is places in the chocolate and rolled between your hands to make the froth. I was actually impressed by how much froth it made! With the hot chocolate we also had some sweet bread. 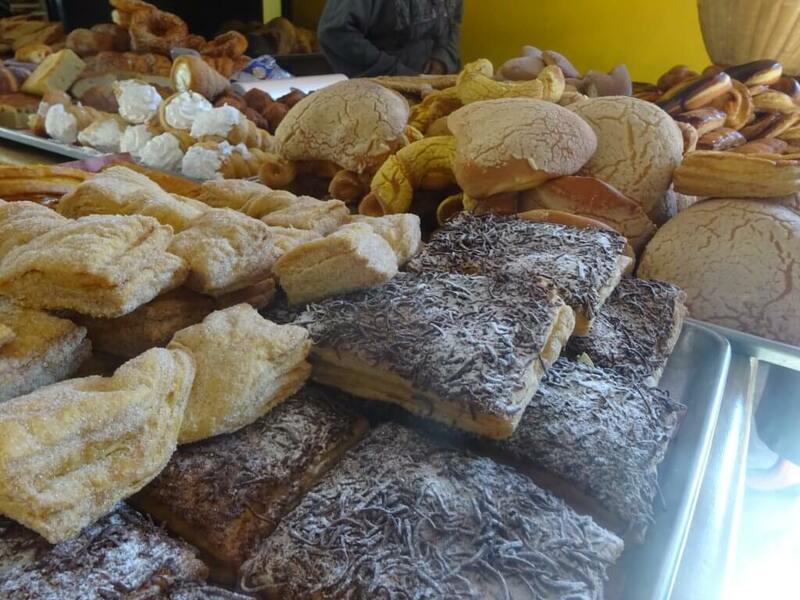 This is a must in Mexico, you can not have hot chocolate without sweet bread! You dip the bread in the hot chocolate and it is so good. 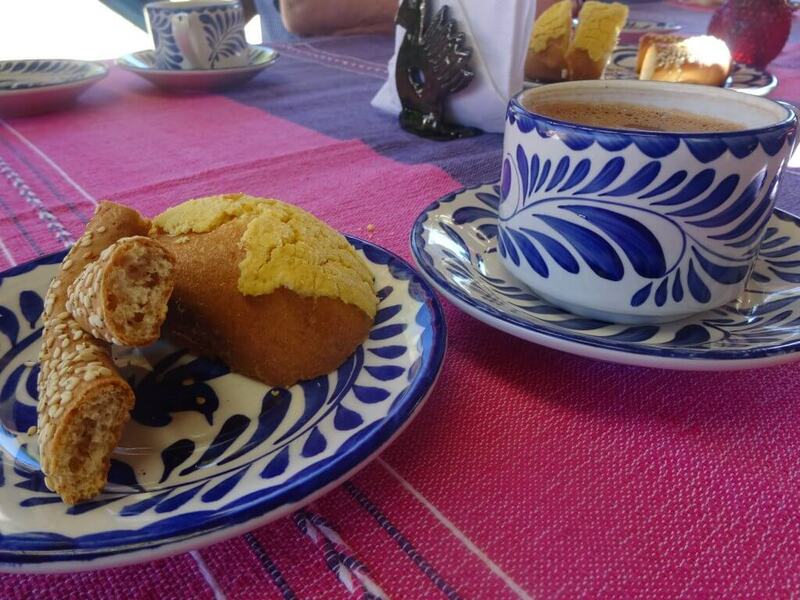 It’s the Mexican version of tea and biscuits, and I am not sure which I prefer! Reyna had also bought us all some tamales and salsa. Wrapped up in the corn leaves, these were still warm. 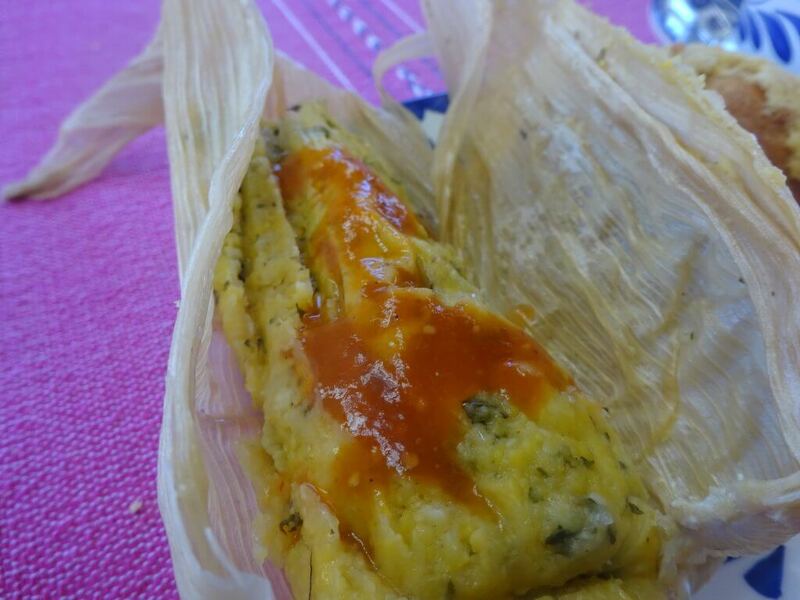 I am unsure as to what was in these tamales, but they were so good! And the salsa wasn’t too spicy for me, bonus! 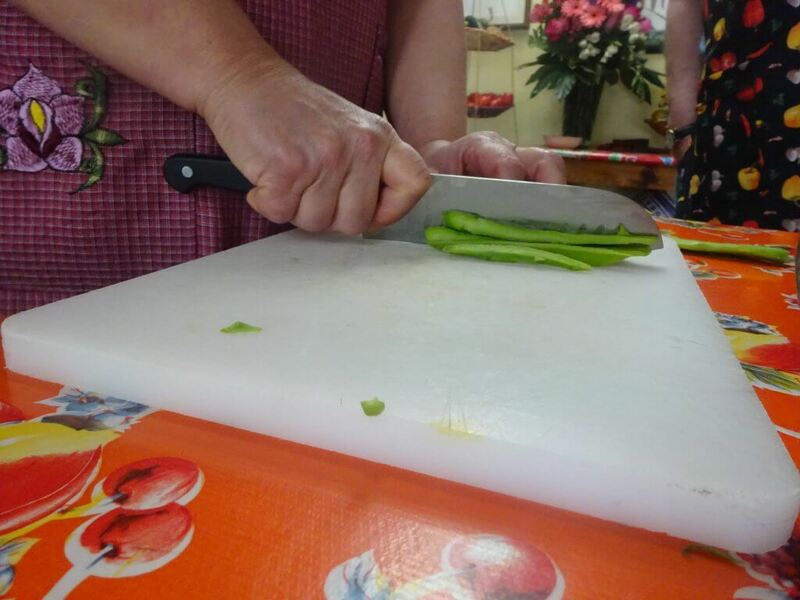 There was lots to do to prepare all of the recipes; so Reyna had different people doing different things. She demonstrated each time and encouraged everyone to have a go. As someone was chopping the cactus, someone else was removing the pistils from the pumpkin flowers. At the same time the rest of us started to roast the corn over the fire. This was fun, there was a large metal disc above a fire (called a comal). It is a simple, yet efficient set up. 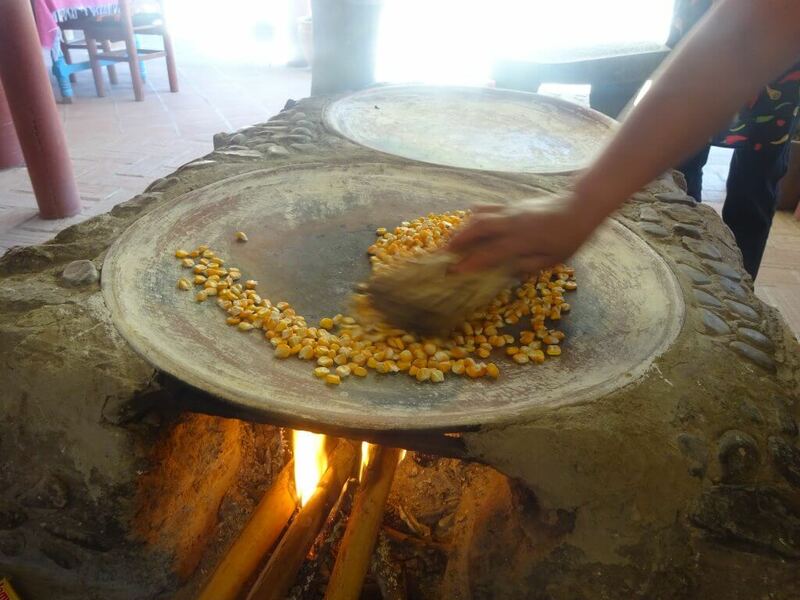 A dry brush was used to move the corn around the disc, for even roasting. Once we could hear the kernels ‘popping’ we knew that they were done. 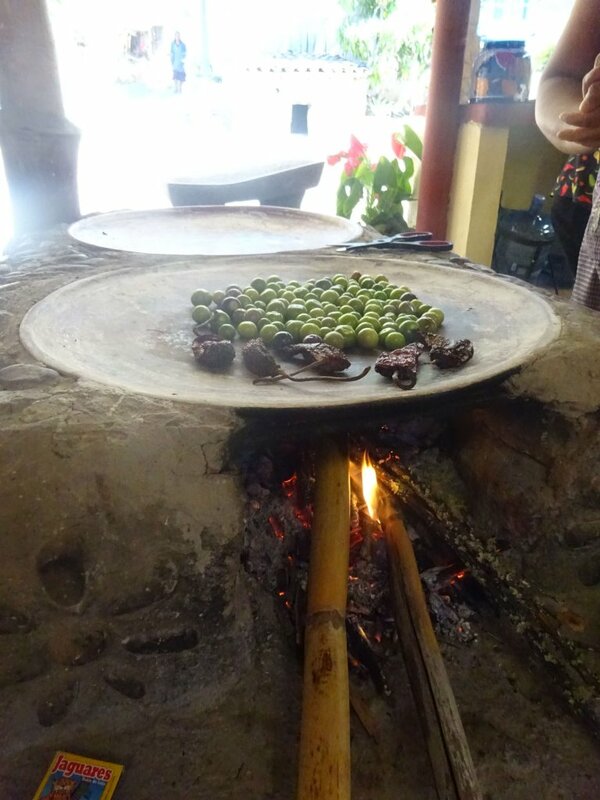 Once the kernels were removed the tomatillos and some chilis went onto the comal to roast. As these were roasting it was time to grind the roasted corn. This was done on a metate, which is basically a pestle and mortar, but instead of a bowl it is a large flat stone. It is set up so that it is slightly slanted and the pestle is a large cylindrical stone that is rolled over the item that is being ground up. It was amazing watching the corn slowly be ground down to a fine powder. Mesmerising to watch! 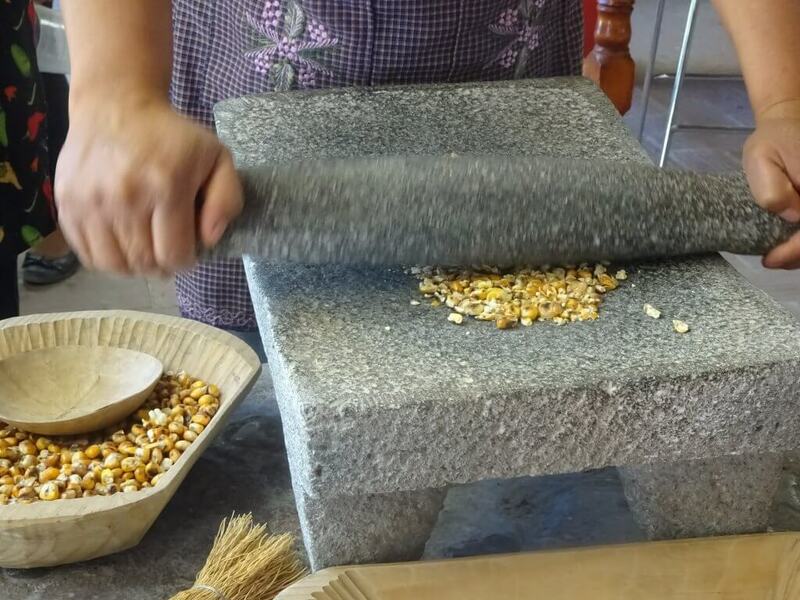 As the corn was being crushed, Reyna took the rest of us to another metate. On this one some other chilis would be crushed into a paste. These were not the chilis that were roasting, but these ones had been soaked and were still in the bowl of water. This makes them easier to grind into paste. After Reyna showed us how it was done, I had a go. It is much harder than Reyna made it look! You really have to put as much strength behind the roller as possible. The chilis would break up no problem, but the skin just would not be crushed. The last bit of skin seemed to take forever! It was not the cleanest of processes, I managed to get chili everywhere! 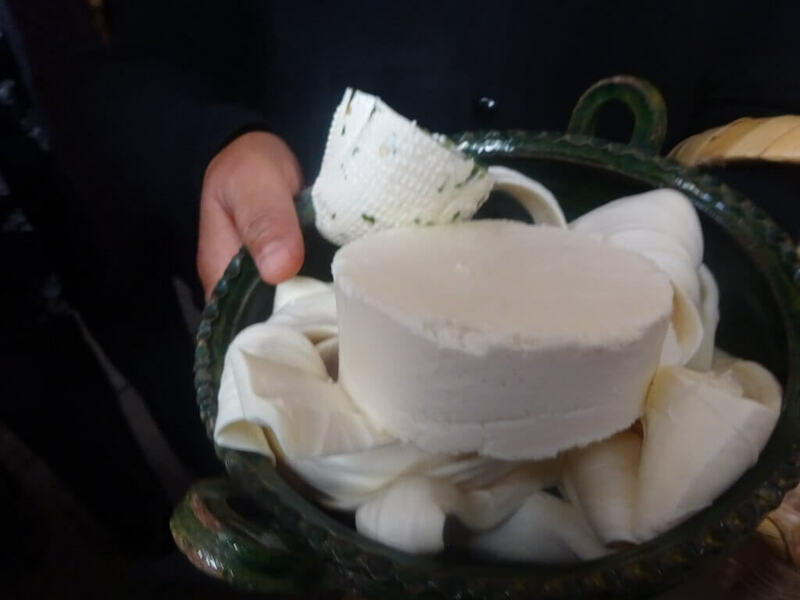 As the paste was developed it had to be scraped off into a bowl below the metate.This process seemed to take hours and by the end it had gotten personal between me and one of the chilis! 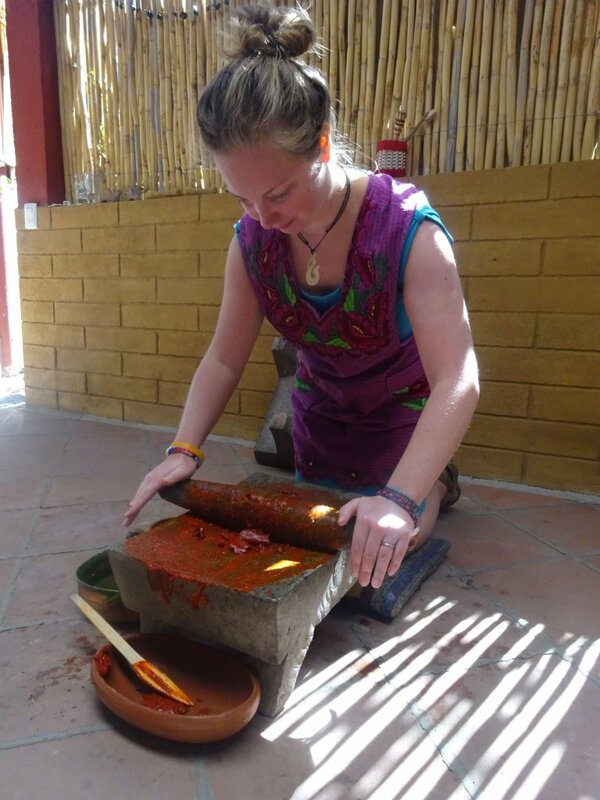 As I was making the chili paste, Reyna told us about the metate. She had loads. Rows upon rows of them, all nicely displayed. She told us that they are often given as wedding presents and then passed down through the generations. So she had a lot of her family’s metates that had been passed down to her over the years. As I had been busy with the chili paste, a lot had been going on with the others. So I went over to lend a hand. The pistils had all been removed from the pumpkin flowers and these were no being prepared. The stem was cut short and a chunk of Oaxacan cheese was placed in the flower, which the petals were folded over as much as possible. Then the flower was dipped in egg and then rolled in breadcrumbs. The idea was to completely cover the flower in breadcrumbs and a few of us got a good conveyor belt going! As this was being done, someone else was making the avocado salsa, by crushing the ingredients together with a good old pestle and mortar. The ingredients for the salad had also been nicely laid out. Reyna showed us how to make ‘boats’ out of the dried corn leaves. To do this a strip is pulled off and then tied at the end. Simple! As a few of us were making the boats, someone else mixed the avocado salsa with the salad. The salad was then divided out into the boats and some cheese was sprinkled on top. As we were busy with the salad the pumpkin flowers were being fried and the Zegueza was happily simmering away. Once we had all finished our tasks Reyna invited us all to sit down at the table again. Now it was time to sample what we had made. And there was a lot of it! Reyna offered us each a cerveza (beer) and mezcal to go with our meals, which we all took. 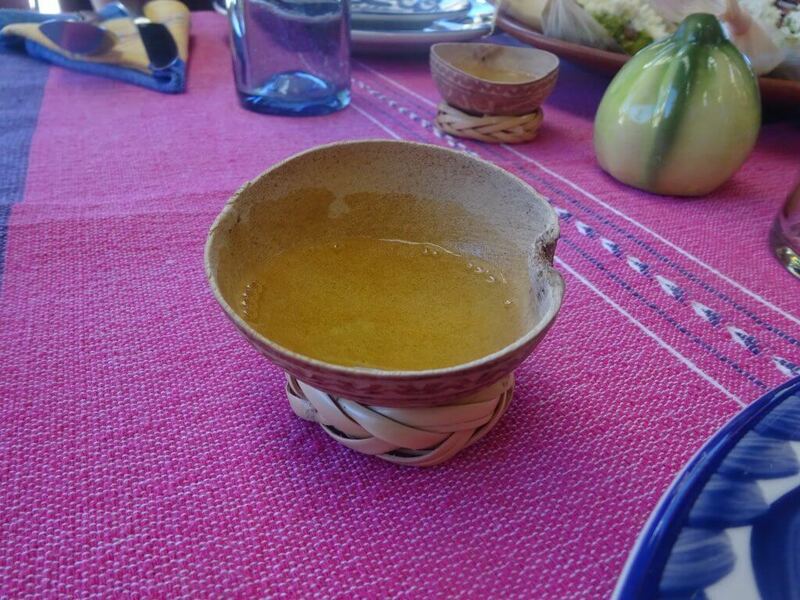 I have to say the mezcal cups were the cutest little things ever! They stood on little woven stands and were just so cool! Next was the Zegueza, I expected this to be spicier than it was if I’m honest. But it was still nice. And of course there were tortillas to go with this. Although I did feel that we hadn’t really cooked this, a lot of prep for this one was done before we were there or as we were busy with other things. I thought that that was it for the food, but Reyna had a little surprise for us! 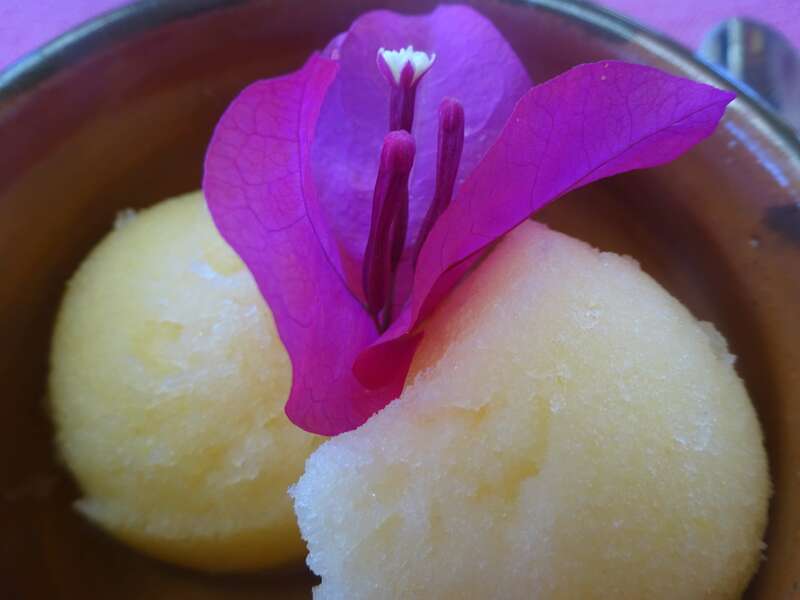 Fresh sorbet! It was presented with a little flower on top, it looked so cute. And yes, it was lovely and refreshing. Perfect end to the meal. All in all, I must say the pumpkin flower was my favourite meal here. I loved it. Who knew stuffing cheese in a pumpkin flower and then frying it with a breadcrumb coating could be so delicious? 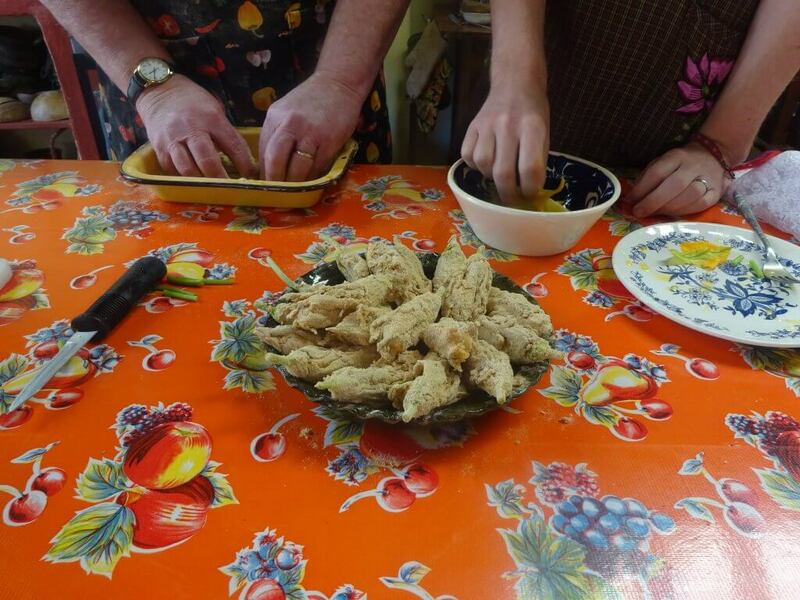 We were each given the recipes so that we can do them at home. Unfortunately I feel there are a few things I would need to substitute back home so it wouldn’t quite be the same. But I still plan to give it a try! 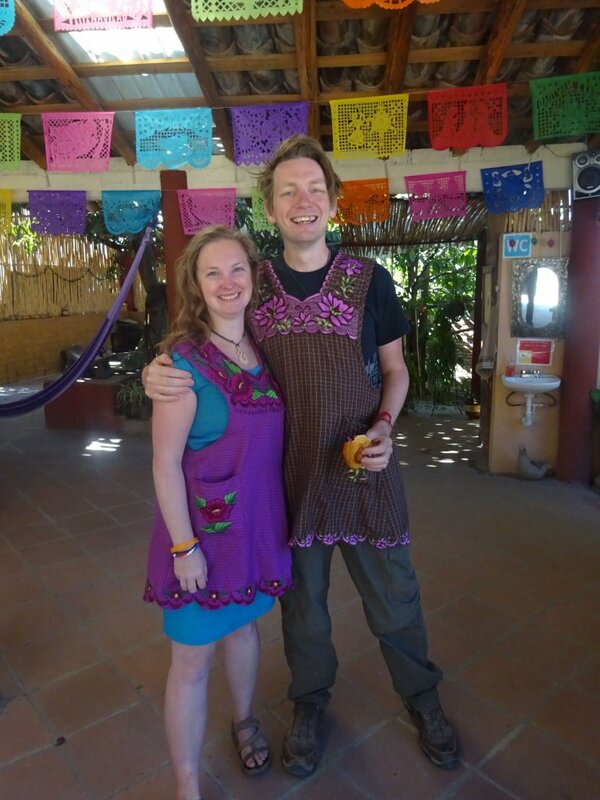 After we had all finished eating and chatting it was time to head back to Oaxaca city. Unfortunately though, only one taxi had turned up! So me and Dave waited with another couple whilst the others headed back to the city. It wasn’t bad waiting around, Reyna chatted to us and was happy to show us the plants in her garden. But soon our taxi arrived and we were saying our goodbyes and thanks to Reyna. The fun didn’t stop there. We had only gone a few minutes up the road when the driver stopped outside of another house. He told us he had to pick something up (we think). So he left the car and disappeared into the house. We waited. And waited. Then we waited some more. This was getting a little worrying. He had been gone for over a quarter of an hour! So we had all come up with various things he could be doing. Wondering if we should go and find him. But luckily he arrived back moments later with many apologies. And nothing else exciting happened on the way back.